Mine Nur Akarsu spent a full month at Jiwa Damai. 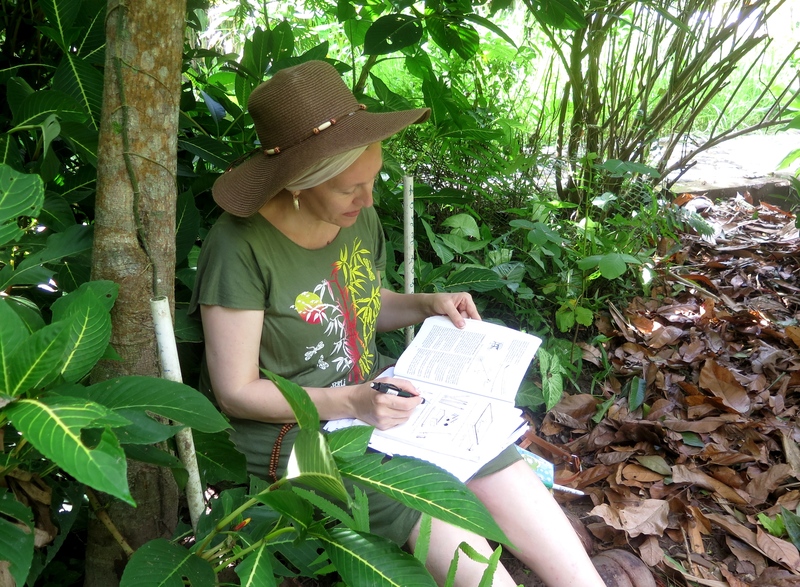 Her project was to research and improve our medicinal plant area in the garden. She spent some time with our head gardener Ketut Badung, who is very knowledgeable with the Balinese healing plants. She brought many plant cuttings from his garden and started a directory with the local and English names including the information about the healing qualities and growing requirements of the plants. Mine and our experienced gardener Liz have been broadening the existing area, planting, and creating a healing and peaceful environment for our retreat center volunteers, workers, and guests. The written detail will be available for those who are interested in this research. 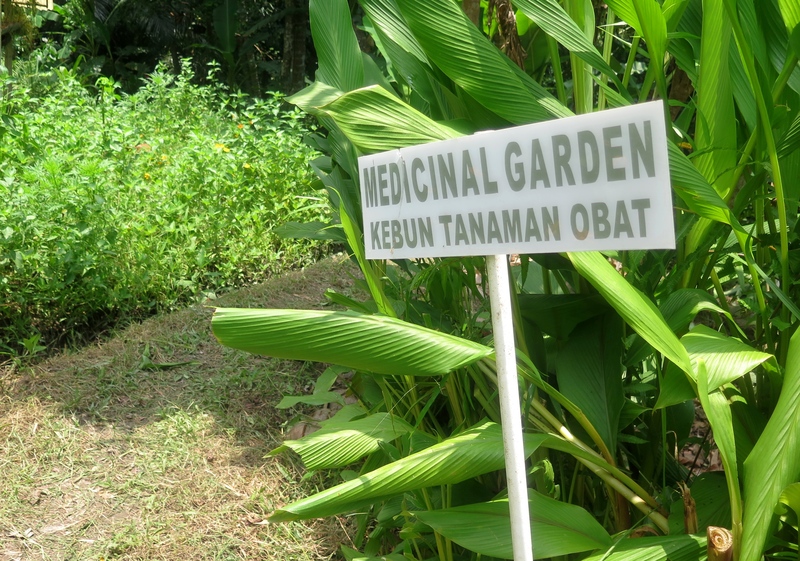 If you’d like to take a look around our new and improved Medicinal Garden, be sure to stop by as it is a part of garden tour which happens on Wednesday and Sunday mornings. These photos do not do Mother Earth’s gifts any justice! 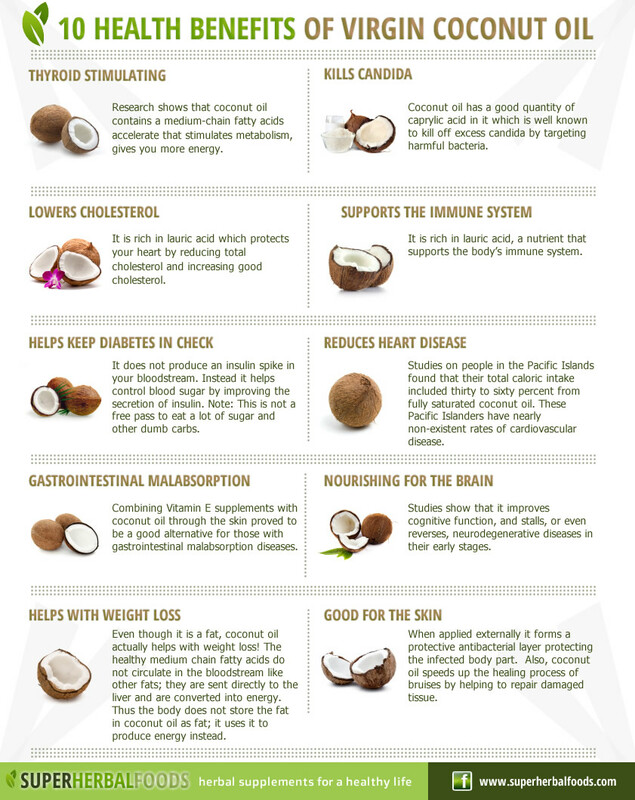 Here at Jiwa Damai, we produce our own virgin coconut oil with the organic coconuts grown on the property. Not only do we use the coconut oil in our kitchen for each meal, we also have various sized bottles available for sale in our small shop. 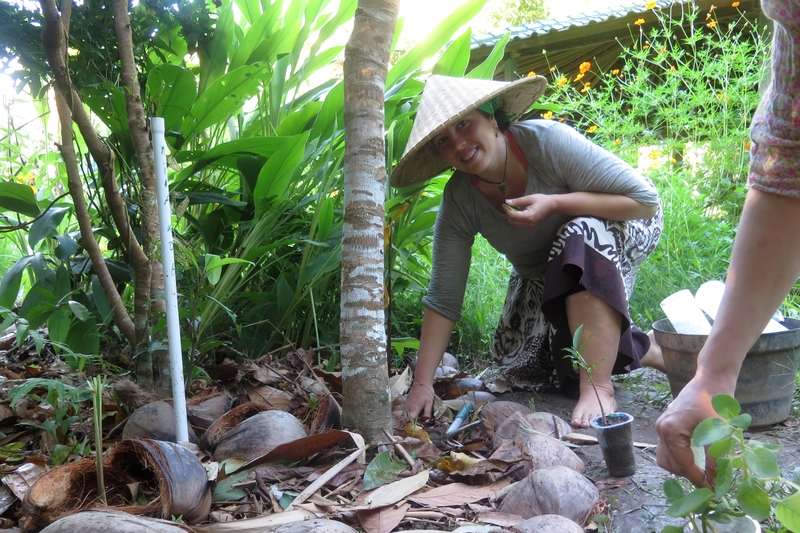 We use a very special process to extract the oil from each coconut, which is done by hand by our lovely Balinese staff. We would love for you to click the pictures below and read more about this process in our simple step by step guide. Have you tried this method before? If not, what other methods have you used? We would love for you to comment below and share with us! During his visit, Juergen from Germany, who is a Geomantist, the European version of Feng Shui, observed the property and its layout. Since many waters embrace and flow through Jiwa Damai, he strongly suggested adding stones, preferably Lava stones, the fire element, to balance the water on the property. 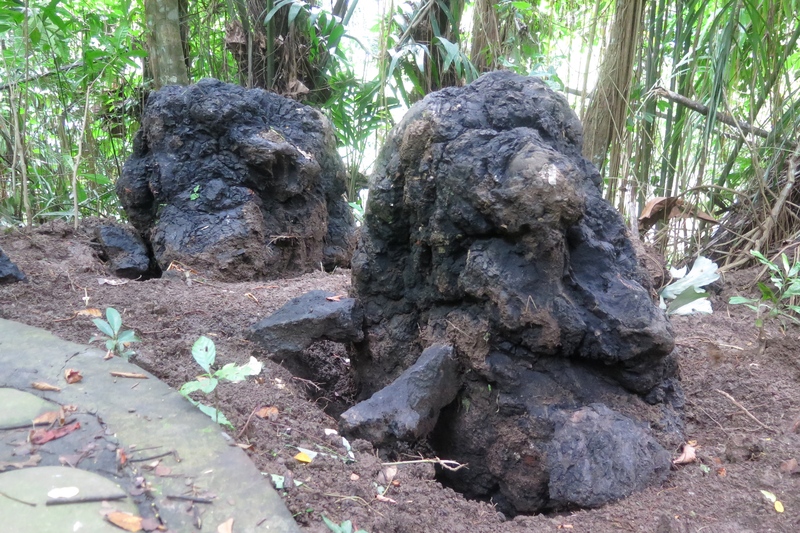 What a great reason to make Jiwa Damai a home for huge lava stones from Mount Agung, the holy mountain in Bali. After inspecting and choosing the location carefully, a crew of ten men transported each rock, the largest one weighing 350 kg, to its location. The rocks are set 35-40% deep into the earth and placed on the opposite ends of our garden. Five rocks have been brought to Jiwa Damai and two of them are still awaiting their placement. 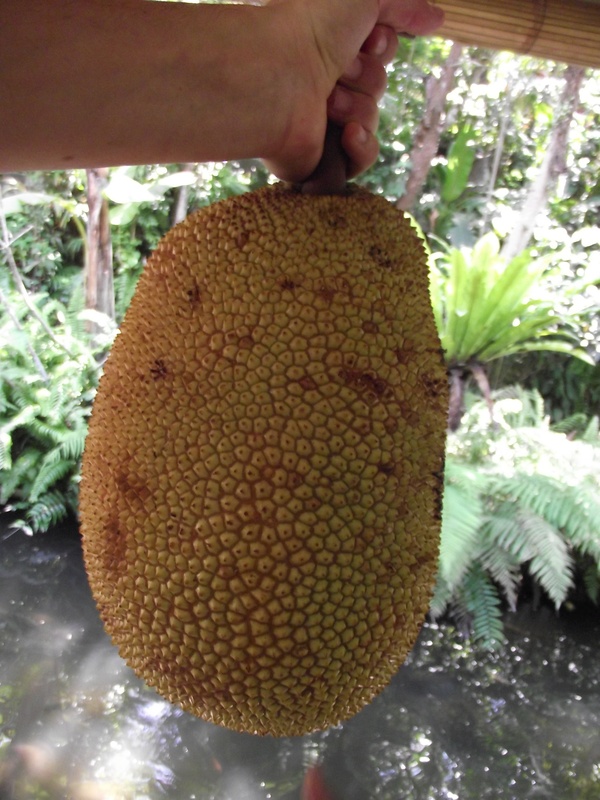 We are currently enjoying our second flush of organic Jackfruit from the garden. The trees fruited a few months ago before Christmas and are again yielding mammoth fruits for us to savour. Parting the strong skin with a large knife and peeling out the fruit makes our hands very sticky, while providing a unique aroma and taste. We thinly slice some of the fruit to put in our dehydrator, so we can enjoy this delicious treat on the out-of-season months. 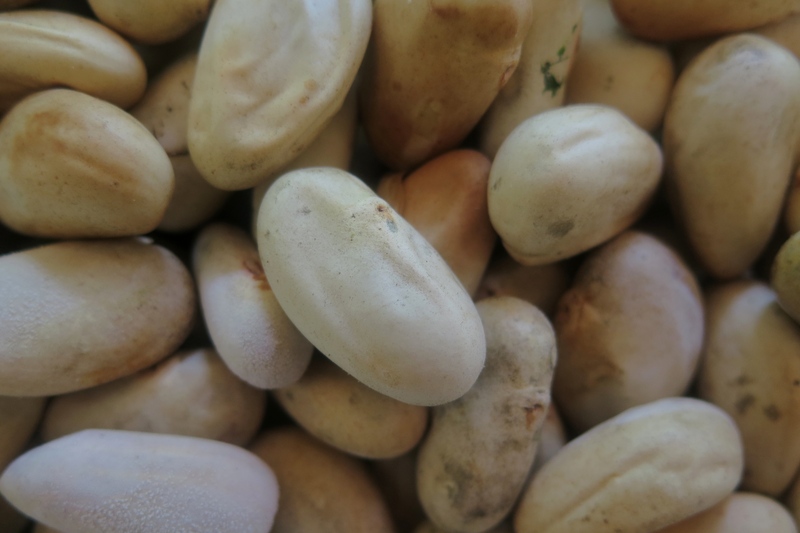 The seeds can be chopped and roasted for salads, boiled and blended into a delicious rich hummus, or boiled in soups and stews. Our pond fish enjoy eating the remaining Jackfruit flesh attached to the peel as a special seasonal treat and for some variation in their diet. Yes, pond fish love fruit too! You’ll never have to throw away a peel again if you simply compost it or feed it to whatever friendly critters you have around. You may see trees with large sacks hanging between the branches all over our garden. These are the young Jackfruit which we cover in order to protect from fruit flies that sting and destroy it. All fruit is enjoyed without using poisonous and harmful chemicals.